Servers | KGS | Joseki contest with nice prizes! Joseki contest with nice prizes! I decided to post the announcement here, because all games from this contest are KGS games. If 5d+ players have answered, they will probably give better solutions than kyu players. Will they win prizes they don't need or will you judge solutions, based on player's levels? Nice contest though! And nice blog! 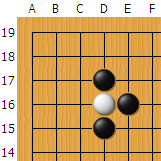 Can we analyse all 3 joseki? We start receiving answers, but mainly from 5d+ players. Kyu players, pls try too!